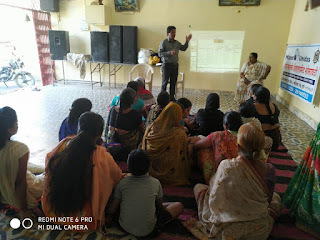 7-February-2019, Koregaon Park (Pune): The Don Bosco Development Society, Pune organized a ‘Financial Literacy’ training program for SHG women from Ashok Nagar slum in Pune. 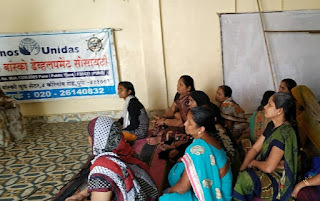 21 women participated in this training program organized under the aegis of ‘women empowerment project’ funded by Manos Unidas, Spain. Mrs. Leena Gaikwad (Staff-DBDS) welcomed the participants and introduced them to the resource person, DBDS works and Project activities. 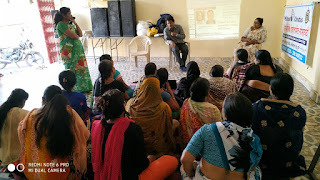 Mr. Nagsen Chavan (Coordinator-DBDS) conducted the financial literacy training workshop. He explained various financial services and products to the participants such as Jan Dhan Yojna, PPF, Sukanya Samriddhi Yojana, Pradhan Mantri Suraksha Bima Yojana, Term Insurance Plan, Health Insurance Plan, Atal Pension Yojana, Post office small saving schemes etc. The resource person also explained various dubious schemes such as Speak Asia Online, Royal Twinkle Star Club Ltd, Pearl, Pancard, Samrudha Jivan yojana, Stock guru India etc to educate participants not to invest in such schemes. Participants asked number of questions which were all answered by the resource person. Program ended with vote of thanks by Mrs. Leena Gaikwad.